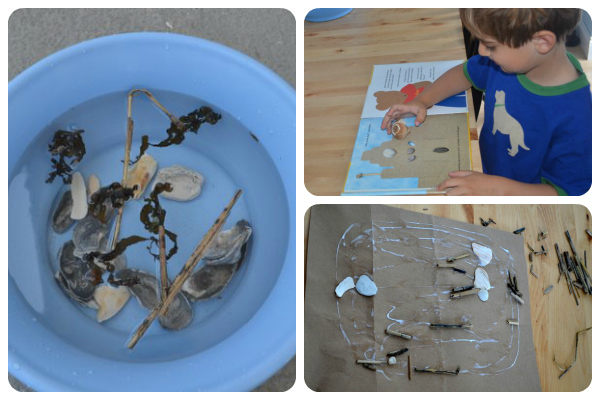 Seashell activities are a lot of fun, and provide opportunities to learn and create! Bivalve or Univalve Seashell Walk. I explained the difference between bivalves (mollusks with 2 shells held together with hinges, such as clams or mussels) compared to univalves (mollusks with a single shell, such as conchs). We then went for a “bivalve walk”, collecting lots and lots of mussels. Once my 4 year old grasped the difference between these 2 types of mollusks, he was very proud and excited to identify bivalves on his own. Once we collected our shells, my four year old divided them up into like groups, and arranged them in age order. The youngest (and therefore smallest shells) were lined up on one end, progressing with ever larger shells to the oldest (largest) shell. We used a simple muffin tin, and my 4 year old categorized them according to his own system, and then described his display to us all. We also created a seashell museum from a cereal box this summer. This is a game that never fails with either of my children. On these beach trips, my one year old has happily thrown shells, seaweed, driftwood and pebbles gathered at the beach into bowls of water. My four year old then lets me know which sink and which float. We made shell collages on the back of paper bags this summer. We also created seashell characters for our stories. We bring Shells! Shells! Shells! written and illustrated by Nancy Elizabeth Wallace with us to the beach each year. This year, in addition to reading it, my 4 year old got the book out and matched up the shells he collected to the ones described in the book. He requested this book be read to him multiple times a day, and repeated shell facts and jokes from the book throughout our beach stay. 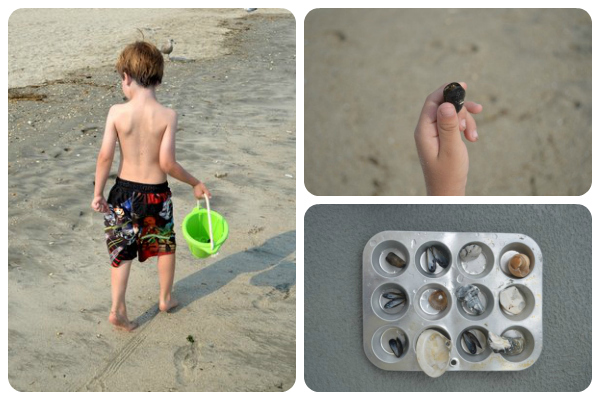 Do you and your children collect shells? 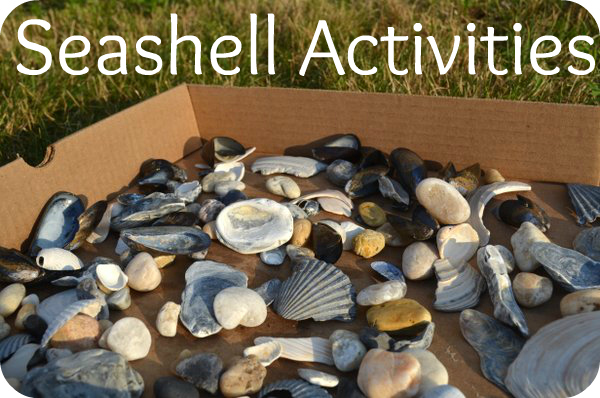 Let us know your favorite shell activity!